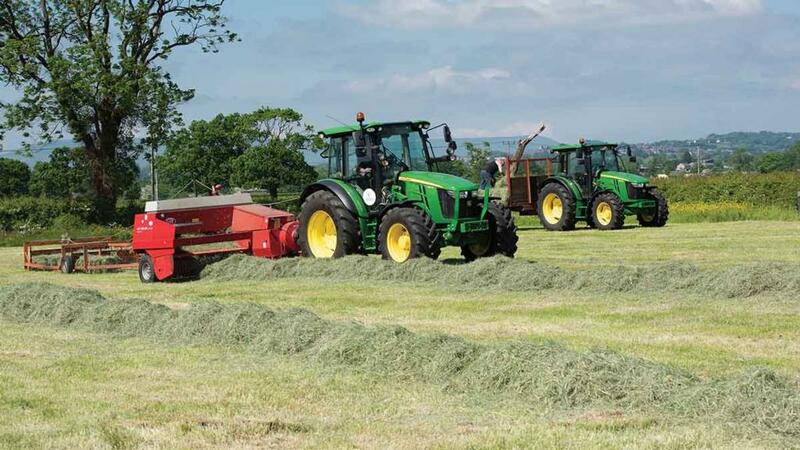 With a growing trend among manufacturers towards offering wider specification levels of the same tractor range, particularly in the lower power brackets, we examine how John Deere differentiates its products. 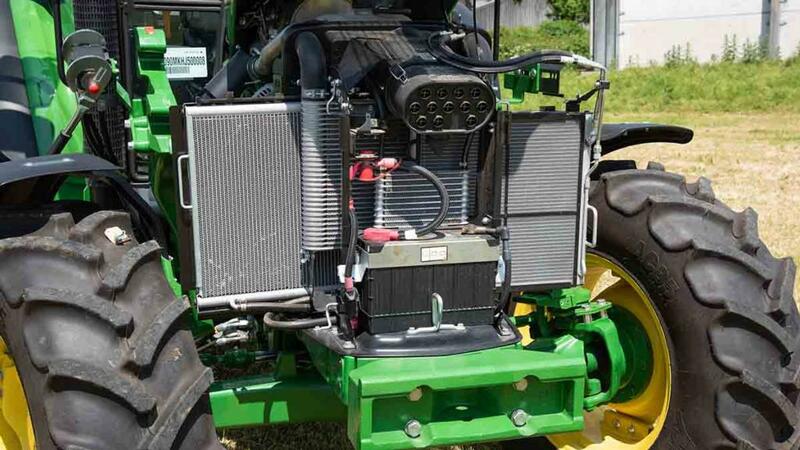 And like its competitors in this popular 75-125hp power bracket, John Deere has to offer a diverse product range, appealing to customers from those who want something very simple, to those who want all the bells and whistles. This means effectively offering two parallel ranges – a high spec one, the 5R; and a lower-spec version, the 5M. It is a similar story for Massey Ferguson, for example, with its ‘basic’ 5700 Global Series and its higher-spec 5700 S Series. Likewise, New Holland offers the T5 Utility alongside its T5 ElectroCommand tractors. An even lower-spec 5E range is also available from John Deere, but for the purposes of our test, we wanted to focus on the 5M and 5Rs. 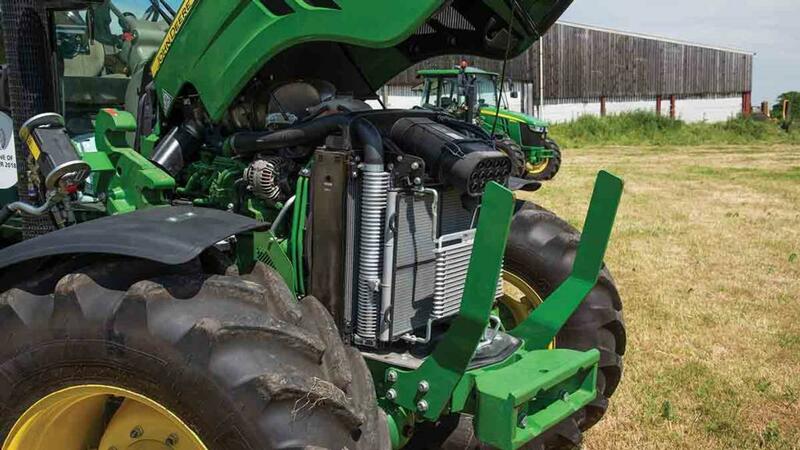 Can one high horsepower John Deere tractor be a jack of all trades? On-test: John Deere 6250R: David or Goliath? Recent JD developments have seen its 5Rs completely re-designed, while more modest updates have been made to the 5M. With the 5M, it is very much a case of what you see is what you get, while the 5R is available with more toys and options. So how much of a difference is there between the two? And at the end of the day, what do you get for your money? With the help from Cornthwaite Agricultural’s Geoff Whiteside, we intended to find out by bringing together a 5090M and a 5100R for comparison. Both were fitted with John Deere loaders. 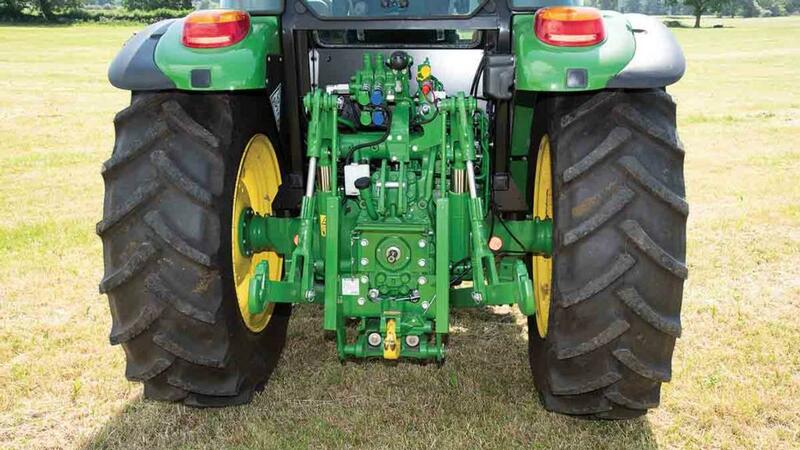 POWER for both tractors comes from Deere’s own 4.5-litre engines. But to achieve a greater load bearing capacity, the 5R’s engine uses a ‘stressed’ sump design, allowing it to cope with greater loads compared to the 5M, which uses support rails. This also has the upshot of providing the 5R with a tight turning circle. In addition, the 5R gets a 10hp boost for transport applications which incrementally kicks in above 15kph, reaching full power at 20kph. Once speed drops below this, the boost feature is not lost until 10kph. As engines are similar, cooling packages are also similar. However, cooling package access does differ greatly. As the 5R’s battery is under the right-hand cab steps, it means its radiator packs can fold forwards, affording plenty of space for a good clean-out. Conversely, the 5M’s radiator access is compromised by its battery and air cleaner being positioned under the bonnet at the front, although access to these two elements is easier as a result. To aid radiator cleaning on the 5M, the radiators do slide out sideways. However, it is the transmission differences which really split the two tractors. While the 5R gets the firm’s Command 8, 32 by 32 semipowershift transmission, the 5M is fitted with a synchromesh 32 by 16 gearbox. As it suggests, Command 8 comprises four ranges with eight powershifts in each, while the 5M’s 32 by 16 is made up of four ranges, with four gears in each range, along with a splitter in each gear. Both get a power shuttle. If the tractor is to be mostly used for yard duties with the odd bit of field work, then the 5M’s mechanically-controlled transmission will more than suffice. Gear changes are fairly slick, and a de-clutch button on the main gearstick along with a splitter adds to operational flexibility. Shuttle aggression on the 5M can also be adjusted via a dial on the dash, allowing you to tailor it to the job at hand, or your preferences. However, if you want greater control over speed, especially if the tractor is to be used for mostly fieldwork, then the higher-spec 5R’s ‘box is the one. With eight shifts in each range, it does offer a good range of speed with close ratios. As well as manual, the 5R can be driven in automatic. When used in automatic, gear changes are limited to whichever range or groups of ranges are selected. This really comes into its own for transport work with C/D ranges selected for the un-laden journey, and B/C/D ranges used for the loaded journey. Shifts could do with being a little snappier, which JD is usually famous for, and it would be useful if there was a momentary drop in engine rpm while the tractor carries out an automatic range change, much as you would if you were doing it manually. Gears do speed match though during range changes. In automatic, you can also set a target speed and programme a start-up gear. It sounds complicated, but could not be simpler with target speeds selected via a scroll wheel incorporated into the gearstick. Once set, the tractor will try to achieve that speed by working out the best possible combination of engine rpm and gear ratios – ideal for cultivation work. 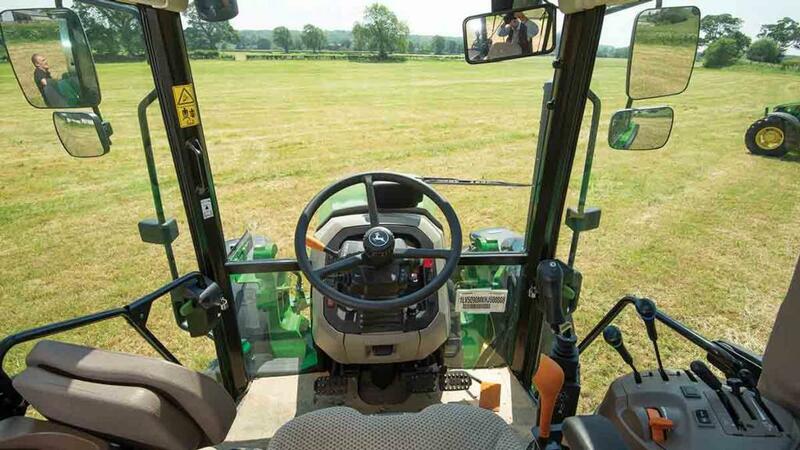 As for start-up gear, this can be quickly set through the tractor’s A-pillar mounted dash. An autoclutch function can also be turned on/off on the 5R, with three levels of adjustable sensitivity. 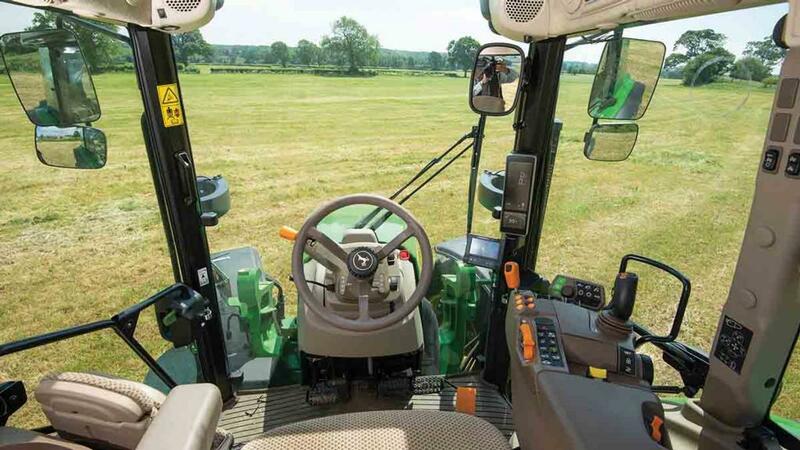 It allows you to clutch by only using the brakes – handy for loading or pausing to stop with a round baler, for example. FROM a distance, you would be hard-pressed to tell the difference between the 5R and 5M – both share the same bonnet styling, both share the same cab frame, so silhouettes are similar. Get closer though, and the differences soon start to become apparent. Visually, some of the biggest differences can be found in the cab, particularly the controls. In the 5M, it is very much a mechanical affair with levers used throughout for gear changes, spool control, linkage settings and pto speed selection. All these fall relatively well to hand, though the head of the main gearstick is quite tight up against your knee, especially when twisting your body to reverse. The gearstick’s gates are also quite close together, with first and third occasionally getting mixed up. As an operator, you are the only influencer as to how the tractor behaves. In contrast, the more electronic-based 5R can be set-up in many ways. Jump on the 5R and it immediately feels a more open and spacious cab. The A-pillar mounted dash, rather than the traditional type as used on the 5M, affords greater forward views around the bonnet, and its clear graphics allows information to be garnered at a glance. Similarly, rather than use a traditional fender-mounted console, our 5R was specced with all primary controls incorporated into its Command Arm arm rest – a traditional control layout is available as an option on the 5R which affords mechanical spool control. For us, the Command Arm puts throttle, transmission, spool and linkage control all at our fingertips. It is very much like driving a mini John Deere 7R. Loader control is also integrated into the Command Arm, which incorporates the ability to change gear and direction. The latter now means the 5R uses a return-tocentre- type left-hand shuttle lever, which does have a tendency to split opinion, as you cannot ‘feel’ the direction you have selected, although an indication on the dash gives you a pretty good clue. Control philosophy and set-up of the 5R is very similar to all larger JD tractors. And even if you are new to JD tractors, the logic of the controls make it relatively easy to get on with. Once you have got your head around the navigation of the A-pillar dash, and the navigation scroll wheel and shortcut keys, you can soon have the tractor set up to your liking. Spool flow and timing, rear linkage parameters and transmission characteristics can all be set. You can also monitor fuel use and work rates. Like the 5M, the 5R’s pto speed selection is done via a lever, although its position is not as convenient as the 5M’s. 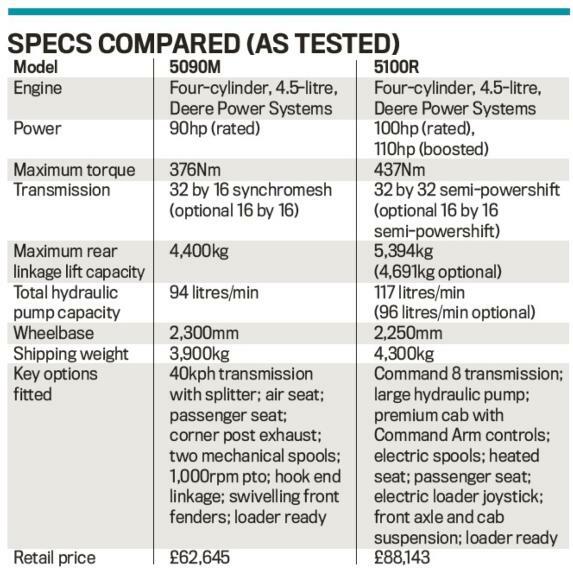 Also, given the 5R’s high-spec credentials, would electronic speed selection not be more suitable? Both the 5M and 5R share the same cab frame, along with roof lining, number of vents and air-con controls. In-cab storage space is similar too, with compartments scattered throughout the cab and a particularly useful pull out drawer under the driver’s seat. Visibility-wise, the six-post cab design with curved rear quarter windows affords good views all round. Various roof window options allow good views to raised loaders. Passenger seats did differ, and the simpler, slimmer folding design of the 5R’s made access that little bit easier – it is a shame they cannot be both like this. In the future, Deere’s AutoTrac automatic steering system and IsoBus-ready options will be available for the 5R. 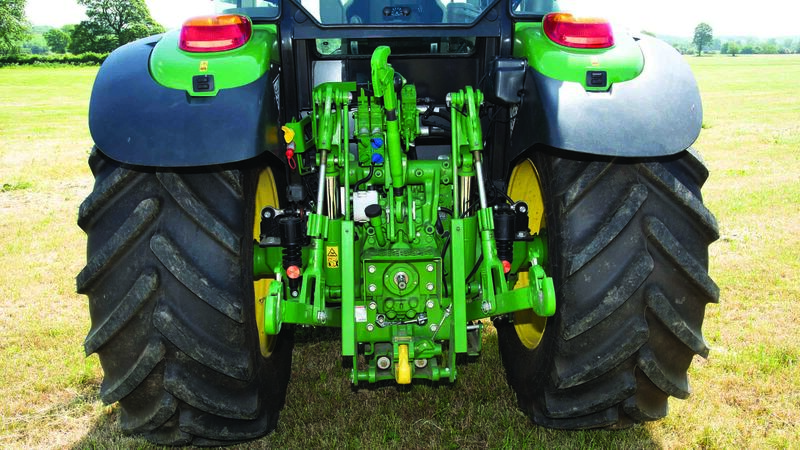 MAKING a real difference to loader performance are the tractors’ hydraulic pump capacities. While the 5R gets a total of 117 litres/min hydraulic pump capacity to play with, resulting in swift loader actions at low rpm, the 5M makes do with 94 litres/min. This said, the 5M is no slouch when it comes to loader work, and would be easily able to hold its own with the equivalent competition, with 70 litres/min dedicated to the hydraulics. At the rear, both tractors look very similar. All castings are the same externally, with only the lift cylinders making a difference to rear linkage lift capacity. Rear spools are biased to the left, although the 5R’s hydraulic trailer brake coupling is a bit too far to the left, unlike the 5M’s which is more central. At present, a push out pickup hitch is not available from the factory for either of the tractors, which would make visibility much better. We are told this option is to be launched soon. It seems JD pickup hitch design is neglected on these tractors, with only an afterthought given to the pickup hitch lift rod mechanism. Harking back to a 20 Series design, the lower portion of the lift rods do stick out a fair way in relation to the pickup hitch’s hook. Lift rods can easily catch on a trailer’s drawbar. This is not very useful if it is on a diet feeder or straw blower, which rely on tight manoeuvrability. And while there is storage at the rear for the pickup hook, there is nowhere to put the drawbar when it is not in use. Maximum rear tyre sizes for both tractors is the same. A 600/65 R34 will give you the widest tyre available, while a 540/65 R38 will give you the tallest. Front axle-wise, 5Ms have to make do with a rigid axle, although a two-wheel drive version is a useful option for yard duties, while 5Rs get the option of fully independent suspension. This is a Carraro unit, and while it offers a comfy ride, it is laden with greasing points. During loader work, there is quite a difference in steering weight, with the 5M much heavier than the 5R, and many of its competitors. As for brakes, the 5M wins here with a much sharper braking action than the 5R, which felt a lot spongier, not just against its internal competition, but also against its rivals. OBVIOUSLY, these two tractors will appeal to different customer types. As we found, the 5M is very much a livestock tractor suited to basic yard work, but can also turn its hand to the odd bit of light field work as and when needed. It is also a very ‘jump on and drive’ sort of a tractor, taking little time to fathom out the controls. As for the 5R, this will appeal to those who want more functionality from a tractor, but yet still retain a relatively compact package. While packed full of electronics, thankfully JD has still made it very simple to set-up and operate. 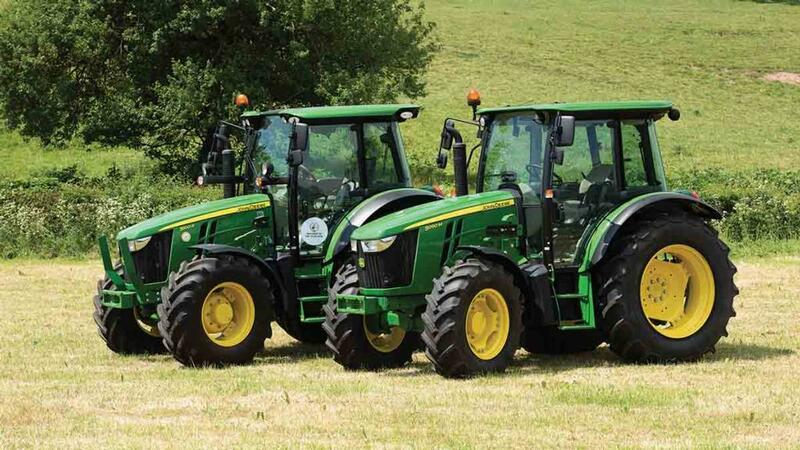 Individually, each tractor is a strong contender in respective sectors – both of which feature fierce competition. In the 5M’s case in particular, this is not only from well-known brands, but also from more alternative makes, such as Arma Trac, Izeki, Branson and Kioti, for example. However, would this competition not be better faced off with a more common approach to tractor build from JD, especially engine/sump design? Surely this would be more cost-effective?